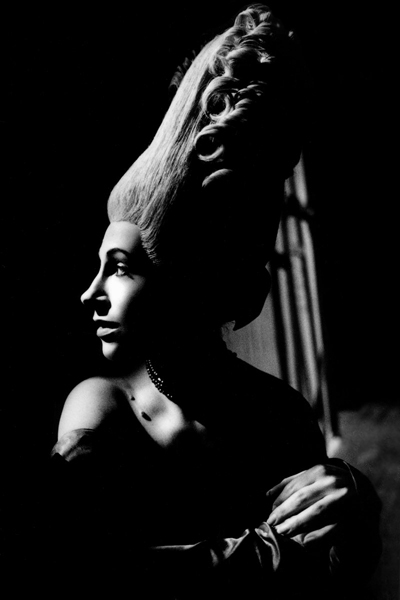 Jane Mitchell, backstage, Royal Opera House, 1994. Photo © David Secombe. Massenet’s Cherubin is a comic opera conceived as a sort of sequel to The Marriage of Figaro. It has received a few revivals in recent years, notably a splendid 1994 production at the Royal Opera House which featured Susan Graham, Angela Georghiou and some extremely arresting wigs. The photo above was taken on the first night of this production, and shows the soprano Jane Mitchell waiting in the wings for her final entry. In the backstage gloom, Jane’s marvellous profile was illuminated by just one, blue worklamp – and I had just enough time (about a minute) to set up my tripod and take a few frames before she left for the finale. I was working on a book project profiling a season of opera and ballet at the Royal Opera House, an offshoot of the famous BBC documentary series The House. The films painted a fascinating and not-entirely flattering portrait of life within the building, and several sackings and resignations ensued. As a stills photographer, I was less concerned with organisation’s internal politicking than I was with the sheer beauty of the working environment. However, complaints about the inadequacy of this environment and its antiquated facilities eventually led to the major redevelopment of the building, which was tied to a major re-landscaping of Covent Garden to monetize the scheme. The unfortunate consequence of this has been a further loss of character for the area: one entire Georgian terrace on the north side of Russell Street was demolished, creating more facilities for the ROH but also adding yet more chain outlets to a district choked by them.